If you are a U.S. citizen travelling abroad or live outside the U.S. you must have noticed that it is not possible to view Netflix directly as you would require a U.S. IP-Adress to View Netflix. For watching movies on Netflix, it is necessary that you have an U.S. IP-address. Also, Some channels are blocked in other parts of the world and geo-restrictions have been imposed on them. It is indeed possible to change to an American IP Address or view the blocked channels in other parts of the world, but in order to do this , you need to be connected to a VPN server which can be a costly affair to set it up. But there is a cheap and a reliable alternative to this. The Best solution to this problem is UnoTelly. UnoTelly is a service that enables you to access geo-restricted channels irrespective of the place where you live. Not only Netflix, There are numerous other channels that can be viewed using UnoTelly. 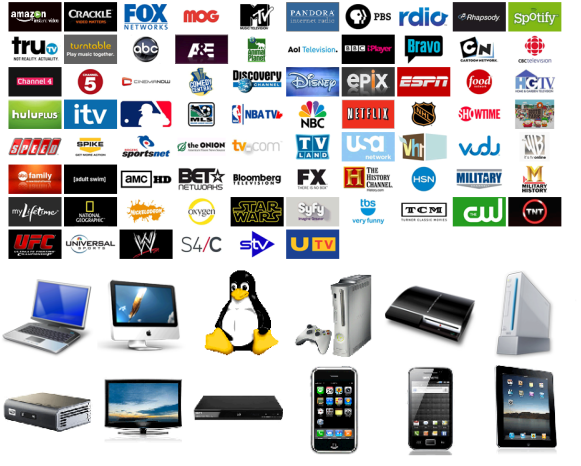 Another great news about this is that it supports almost all the devices, some of which include PC, Mac, Linux, iPhone, iPad, iTouch, Playbook, Android, Xbox 360, Wii, Playstation 3, WD TV Live, Roku, Boxee Box, OpenElec, XBMC, Apple TV, Goolge TV, LG Smart TV, Sony TV and players, Panasonic VIERA, Samsung TV and players, and all routers including DD-WRT. Lets have a look at what UnoTelly has got to offer to its users. Here are some of the key features. 1. Unbeatable device and platform compatibility. You have it. We support it. What’s the point of gaining content freedom if you’re then limited to accessing it through a select few devices or systems? We wondered the same thing, which is why we made UnoDNS™ able to support all possible computer systems, mobile devices, home theatre setups, and routers. This way you get flawless performance and total access to the content you want, no matter what you’re running it on. Experience freedom on a whole new scale! Don’t blink! 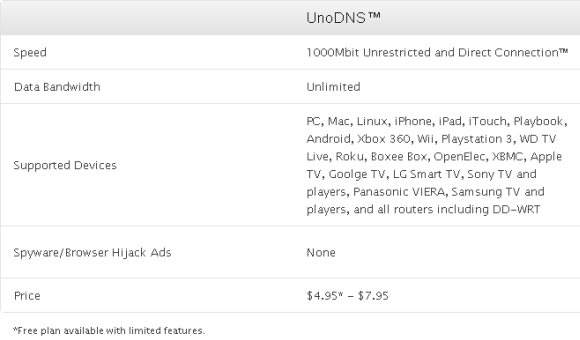 UnoDNS™ employs cutting-edge algorithms that establish high-speed Direct Connections™ to any website imaginable. Forget rerouting through traditional VPN access, making you suffer from lag and spotty service. With UnoDNS™, you’ll enjoy absolutely ZERO speed loss, avoiding any sort of middle-man stealing a piece of the action. 3. TripleSafe says farewell to DNS poisoning and ISP spam. Protect your privacy and block unwanted spam through our TripleSafe service. Have you ever misspelled a domain name, only to be redirected to your ISP’s website and bombarded with spammy ads? That’s a nasty little trick called DNS poisoning, and we aren’t having any of that here! TripleSafe eliminates all DNS poisoning, replacing spam and ad pages with the oldfashioned “Browser Cannot Find the Page” message. Relax knowing that your browsing is safe and secure, entirely in your control, and with your sensitive data far from prying eyes. 4. Break into the cloud! 5. Help isn’t on the way. It’s already here. UnoHelper to the rescue! Forget complicated setup procedures that require a hundred-page user manual just to get started. Our groundbreaking app makes setup a snap, specifically designed to get you up-and-running as quickly as possible. We specifically designed UnoHelper to guide you through the account creation process, plus manage all auxiliary services, such as one-click DNS changes and automatic IP address updates so you can stay connected 24/7. 6. Entertainment the entire family can enjoy! We know you value your family and want to find ways to bring everyone closer together. That’s why we have the FamilyShare feature to provide multiple logins across multiple devices, ensuring that no one misses out on their favorite content. Share access with as many people in the same household as you wish. With FamilyShare, your spouse, your parents, your children— even your cat—can enjoy everything UnoDNS has to offer. Additionally, Here are some discount coupons exclusively for readers of Techarta. If you are looking forward to use this service, Do use the coupon codes to avail benefits and do let us know how Good UnoTelly has turned up for you. For more details on UnoDNS, visit Unotelly. Now that Netflix is available in the UK they are also competing with LOVEFiLM. If you are looking to see which one you would prefer and to compare the two then why not visit Netflix vs LOVEFiLM. SmartWatch: To Be Or Not To Be? I saw your blog and took your advice, Unotelly really is a great service. Now i can enjoy Netflix and Hulu anywhere I go from my android. BW is way bigger (3-4 times more) than the VPN solutions. try it free for a week . I tried it after I had some unsuccessful tries with the VPN solutions to wach HDX or even HD failed. The only solution which gave a decent speed was the Unlbock-US solution. I have found a great solution that you can test out. It allows me to access the best US TV, video, movies. It’s called GetUSAWebsites.TV and if you use the code 9015 you can try it for free.